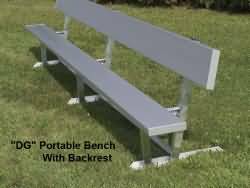 Our portable aluminum bench with back will make a great players bench for your outdoor football or soccer field. It also makes a great baseball dugout bench. 4'L Portable Bench With Back Weight 84 lbs.